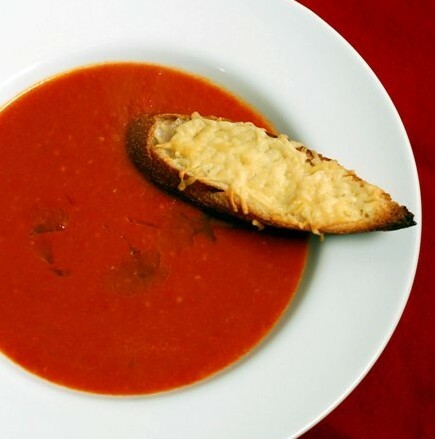 Creamy Tomato Soup | What's Cooking at the Genua's? Now that the weather is finally cooling down a little bit here I am starting to think of soups more. Yes, even in sunny and warm south Florida our winter’s get cooler and soup is a welcome meal. Now, I was never a big fan of tomato soup but my husband likes it but I am willing to give it a try. This recipe sounds very good and is pretty easy to make. It makes 10 cups and serves 6. If you want to freeze it for later or make a double batch freeze it before you add the half-and-half. Just add it when you defrost it to use again. When you reheat the soup don’t let it boil either or the half-and-half will curdle. I love sweet things so this soup is great for me. But if you don’t want it too sweet just reduce the sugar in it. This soup is great with a nice crusty loaf of bread or crackers. Make it a delicious meal for dinner or lunch. Top it off with some parmesan cheese also if you like, you know we will! You can also cut the garlic in half as well if you don’t like too much garlic. I of course added more than the recipe originally called for. Photo is for illustrative purposes only! 1. Heat the olive oil in a large saucepan. Add the onion, carrot and bay leaf and cook over medium high heat, stirring occasionally until the vegetables are soft, about 5 minutes. Add garlic and cook, stirring for 1-2 minutes. Add the brown sugar and cloves. Stir until vegetables are well coated. 2. Add the vegetable broth and tomatoes, bring to a simmer. Cover and reduce heat to medium-low and cook, stirring occasionally, about 30 minutes. 3. Remove the pan from the heat. Remove and discard the bay leaf. Puree the soup with an immersion blender or in a regular blender until smooth. You may have to do it in batches until it’s all blended. 4. Add the salt and pepper. Slowly pour in half-and-half, stirring constantly. Serve right away or refrigerate until ready to serve. Remember not to let the soup boil when reheating or the cream will curdle! Makes 10 cups: Serves 6. I so love tomato soup! It’s certainly time to whip up a pot! Thanks!